"Honda Racing may be the first team to publicly commit themselves to doing something about global warming...the FIA has been working behind the scenes for a decade on dealing with carbon emissions from the sport." Because to us, nothing says "doing something about global warming" like running an engine at 20,000 rpm that produces up to 740 hp. Right — good job to both FIA and Honda for doing so much to be enviro-conscious. Although we're not complaining about Formula One, which we love to watch — we're more than happy to make fun of the sometimes silly marketing that goes on behind it. I mean, I wonder if the paint's got lead in it too? Full press release after the jump and gallery below. The Honda Racing F1 Team today announced a major new initiative for the 2007 Formula 1 season. 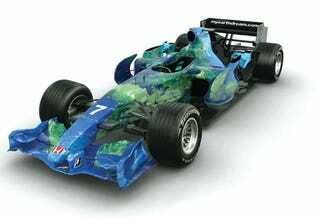 To help raise awareness of the environmental issues facing the planet, the RA107 F1 car will simply feature a huge image of earth, in place of the advertising and sponsor logos which have featured and dominated all other F1 cars for decades. The car's new look is a powerful call to action for fans, sponsors, customers and members of the public to join Honda's commitment to help address the environmental issues facing the world. Via the websitewww.myearthdream.com, anyone who wishes, will have the opportunity to have their name on the car, make a pledge to make a lifestyle change to improve the environment and make a donation to an environmental charity. Under the concept of "our car is your car", each name will form a tiny individual pixel which will help build the image of planet earth on the car. Each name will be visible on the website when you make the pledge or under a microscope on the car. Universal Music, the largest music company in the world, and Gatorade are the first global brands to partner the team in this exciting new concept. Existing partners have enthusiastically embraced the idea and all remain involved with the team for the 07 season. In addition, the team is delighted to announce that Fila, IBM, Instron, Oliver Sweeney, Perkin Elmer, Showa Denko, TUV and GF Agie Charmilles have joined the roster of team partners and suppliers. The Honda Racing F1 Team will work closely with global environmental charities to develop Honda's existing environmental ethos within the world's most high profile motor-sport. "Climate change is probably the single biggest issue facing our planet and F1 is not immune from it. On the contrary we believe that F1 with its huge global profile and cutting edge technology can play an important role in not only highlighting the issues but also playing our part in developing solutions. In addition, the FIA recognises the opportunity for F1 to play an important role in developing technologies for the benefit of society long term. For example, by 2009, devices for energy recovery will be in place on the cars. "So we at Honda F1 are proud to dedicate our car to the environmental challenge. We believe that solutions can stem directly from engineers working on our F1 program and are working harder than ever to achieve our dreams and win the World Championship while embracing and underscoring Honda's environmental ethos." "First and foremost, we are a race team and F1 is very much a team sport. We achieve our racing objectives only by working together and parallels can be drawn with the way that we must all join together to address the environmental challenge. We hope that in raising awareness and highlighting the issues we will encourage members of the public to come together and help take on the challenge of climate change". "Honda has a huge desire to challenge for this year's 2007 F1 World Championship. We hope this year will be a successful and exciting season. Equally we intend to give something back in the form of our new environmental F1 concept, which we believe will bring something fresh and new to motor sport." "Honda constantly strives to be innovative in both its technology and its thinking and to sincerely respond to the demands of customers and society. Honda has always made great efforts to contribute to the preservation of the environment in its corporate activity. We hope this new initiative for Honda in F1 will help to further stimulate awareness and interest across the world for these important environmental issues."